Investigators were forced by facts and evidence to develop an alternate theory of the crime and discard the original one. Criminal investigators throw out theories once they are contradicted by evidence and form new ones. Uniformitarians, however, throw out evidence because it doesn’t fit their theories. Not only do they throw evidence out, they claim it doesn’t exist. Here is an observed fact: The sun is giving off energy. Non-scientists can “see” its light and feel its warmth, see its effects on melting snow and growing plants. According to a study by John A. Eddy (Harvard -Smithsonian Center for Astrophysics and High Altitude Observatory in Boulder) and Aram A. Boornazian (a mathematician with S. Ross and Co. in Boston) scientific observation over the past 100 years confirms the sun has lost .01 % of its mass per year. Scientists have observed, for the past 400 years, roughly the same rate of loss per 100 years. The sun is shrinking as it is giving off energy, losing mass. Dr Russell Akridge, PhD, says in his 1980 article, “The Sun Is Shrinking,” that at this rate, one million years ago, the current earth’s orbit would have been inside the sun. The sun would have been large enough and hot enough to boil all water off the earth at that size and rate of energy output a mere 50,000 years ago.2 Observed data which fit the sun being fueled by its gravitational collapse (the Kelvin-Helmholtz Contraction Theory) did not support the theory of the earth being 4+ billion years old. Dr. Akridge says that scientists who have a religious belief in vast periods of time adopted Hans Bethe’s theory of Stellar Nucleosynthesis, the thermonuclear theory of the sun’s energy production, in the 1930’s because it allowed for the vast periods of time. Observed facts do not necessarily fit completely with either theory. NASA launched a satellite specifically to observe and gather data on the sun. Solar and Heliophysics Observatory, SOHO, was launched on December 2nd, 1995, from Cape Canaveral. 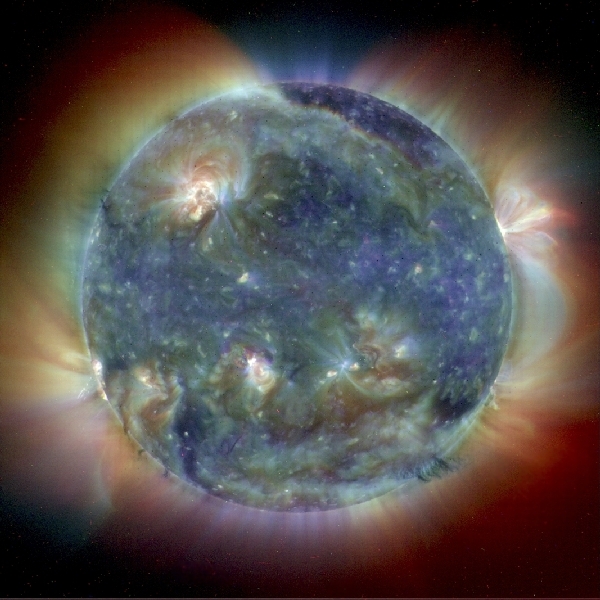 SOHO caused scientists to modify theories on how the sun is fueled. They now believe it is several types of very complex thermonuclear reactions combined with gravitational collapse. According to a 1998 article by Dr. Danny Faulkner, if the sun were only powered by thermonuclear energy, the sun would have been 40% dimmer 4.6 billion years ago than it is today. It would have been too cold to support life on earth even hundreds of millions of years ago. Since uniformitarians cling to the dogma of billions of years, they religiously claim the sun basically evolved from gravitational collapse to thermonuclear reactions. They present complex conditions necessary for the evolution of the earth’s atmosphere, requiring conditions Faulkner calls “nothing short of miraculous.”3 The fact that we are here, they say, is evidence that the sun must have maintained a balance between these energy systems, remaining neither too hot nor too cold, but just right for billions of years. If it hadn’t, we wouldn’t be here. This is circular reasoning. 2 Akridge, R. 1980. The Sun Is Shrinking. Acts & Facts. 9 (4). 3 Faulkner, D. 1998. The Young Faint Sun Paradox and the Age of the Solar System. Acts & Facts. 27 (6).